There are many variations of Sharlotka Apple Cake out there. 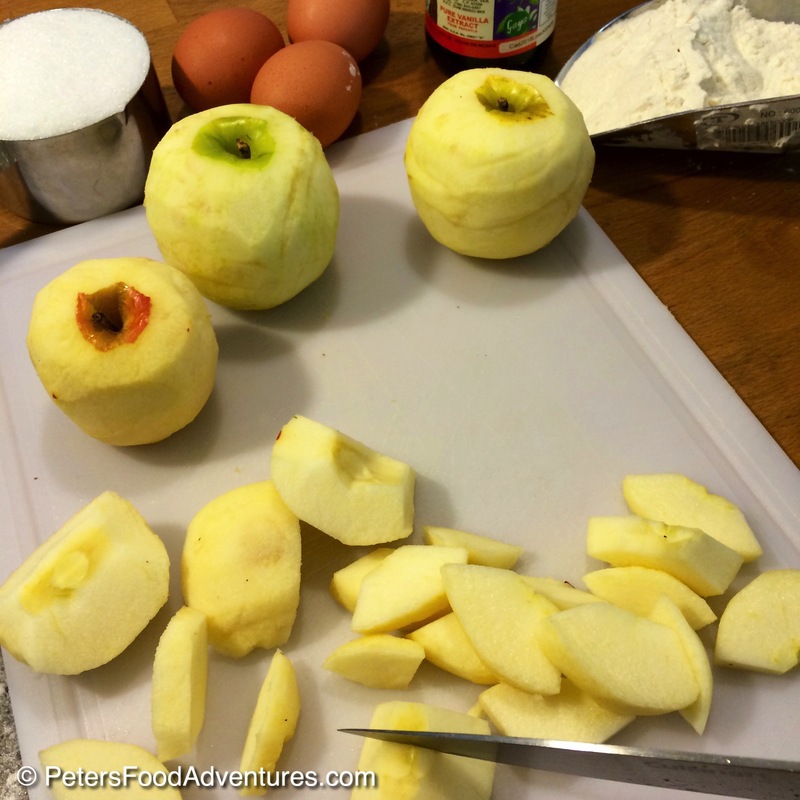 It’s a basic apple cake made with simple ingredients. Some recipes only contain only 4 ingredients! This is not like my American Apple Pie, which is worth checking out, but it’s definitely a cake. This is my wife Rita’s Sharlotka recipe, and I’m grateful she shared the recipe and baked it all for me. Apples and cinnamon are an amazing combination together, one that must not be tinkerevd with, even in the simplest of cakes. The apples aren’t coated in cinnamon and sugar like they are in a pie, but are sprinkled on top of the cake just before serving. There’s a delicate balance of not adding too many apples otherwise the cake will fall apart. Too few apples, and it’s just a glorified sponge cake. This version of Sharlotka Apple Cake requires a bit longer cooking time due to the apple-batter ratio, but it’s still a simple, quick and delicious cake to whip up at a moment’s notice. 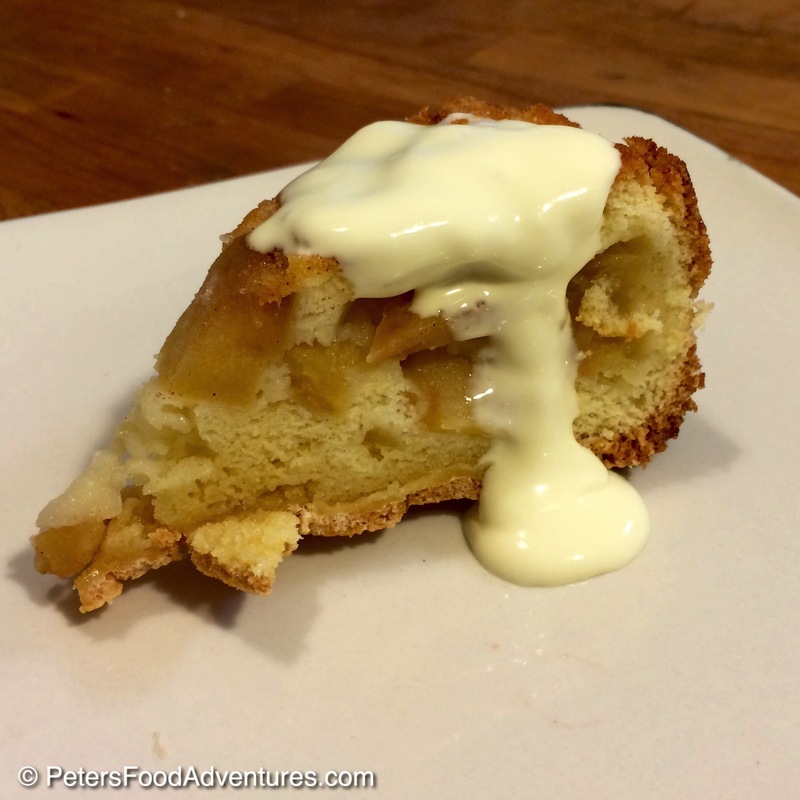 My wife has been baking Sharlotka Apple Cake for years and it’s become a family favorite. Simple food done well, is perfection. Bon Appetit! Приятного аппетита! Preheat the oven to 180°C/350°F. Line a 9x3 round cake pan or springform pan with parchment paper. Butter or spray both the paper, and the sides of the pan. I believe butter gives a better aroma whilst baking instead of an oily chemical aroma. Peel and core the apples, chop in quarters, then slice into thin bite size pieces. Place the apples into the buttered cake pan. Using a mixer or whisk, beat the eggs and sugar in a bowl until the sugar dissolves (around 5 minutes). Add the vanilla and mix throughout mixture. 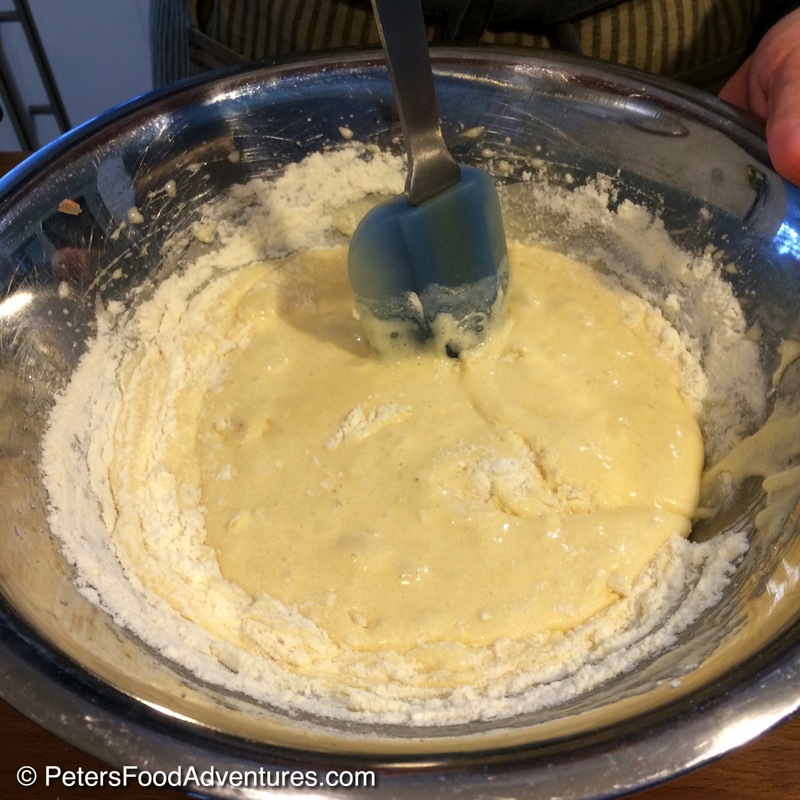 Gently add the flour and mix with a spoon until batter is thick and smooth. Pour over the apples in the cake pan, spreading it evenly over the apples. Gently shake the pan to allow the batter to go down to apples. Bake in the oven for 40-50 minutes. Check cooking time at 40 minutes with a toothpick to see if cake is ready (Some ovens this is enough cooking time). Tip: Don't rush the cooking time, or the centre will remain raw. When cake is ready, allow to cool on a baking tray for 10 minutes. Using a knife, run along sides of the cake pan. Carefully flip upside down onto a baking tray. Peel off the parchment paper, revealing the apple base (now the top of your cake). Sprinkle generously with cinnamon sugar to taste, and transfer to a cake stand or plate. Serve with thickened cream or vanilla bean ice cream. This looks amazing…and I am sure the flavors are memorable! Thanks Deebi! And really easy to make too! ???? Hi Jenny! It depends on a few things, the height and size of the pan and also the size of the apples also. It sound like you did the right thing, don’t fill any higher than ¾. Some people like less apples and more cake so you can fill to half in that case. Hope it worked out well for you! ???? This is fantastic! Loved it so much that I’m sure to bake this again! Thank you for sharing this, Peter!! Thanks Rotwein! It’s my wife’s recipe, a family favourite! ???? Glad you enjoyed it! I was just curious though, no baking powder is used? I panicked because it looked like too few batter…it looks like just barely coated apple slices, so I added a teaspoon of baking in hopes to get a little more oomph! *Patiently waiting for it to finish baking* ???? It is very apple-y ???? hope you love the recipe! I think the lack of baking powder/soda was probably from simpler times when some of those ingredients weren’t available. It is a bit of a denser cake. Enjoy! In the picture it is shown with something served on top..what is it and how do I make it? Hi Nadya, it’s just a slightly whipped whipping cream until it’s thickened but still runny. You can also can use Creme Fraiche, or even a Clotted Cream. ???? The cake is delicious and easy to make. I used Cartland apples because I have a tree full of apples! My cake looked just like the picture. It is great all by itself. Thanks Suzan for trying it out! I’ve not heard of Cartland apples before, but it’s a great way to use any apples off a ripe apple tree! ???? Thanks for checking it out! Wow, sounds delicious! So many variations! ???? Is there a way of making this cake gluten free? I actually had to read the recipe a few times to make sure I was reading correctly and there is no baking powder nor baking soda in it. Went back on line to make sure I actually had the whole recipe. Have a batch in the oven right now so just waiting to see the results. It is already smelling pretty good. Hi, can this be frozen? Hi Lisa. Sorry I don’t honestly know, because it’s never lasted that long in the house! I don’t see why it couldn’t be frozen! If you try it, please let me know!